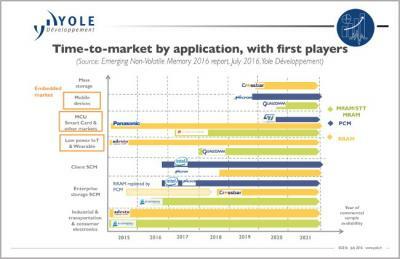 Yole Developpement says that the emerging Non-Volatile Memory (NVM) market is still small, generating only $53 million in sales in 2015. The market is still limited to niche markets due to the limited densities. Yole sees the market growing very quickly, though, to reach $4.6 billion by 2021 - a CAGR of 110%. Yole says that the clear go-to market for emerging-NVM will be storage-class memory. High-capacity SCM applications will use either phase-change memory or RRAM memory, while applications that require high endurance and speed will adopt STT-MRAM memories.